I hesitated to post this recipe now, because I'm not like Lydia who enjoys soup year 'round, or Karen who is addicted to soup. I need cool weather, or at least a rainy day, to enjoy a comforting bowl of soup. 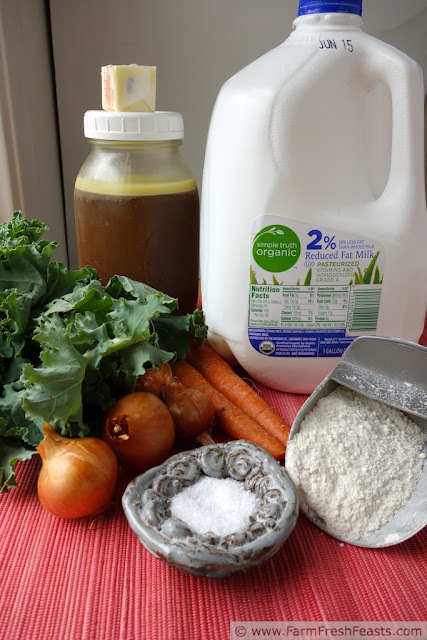 However, I've had several opportunities to enjoy this soup this Spring, so I thought I'd share and give you another kale idea since Spring 'tis the season for greens. Because eating up each week's bag of kale from the CSA farm share doesn't come as effortlessly as eating up, say, a pint of strawberries, I need to work at it. Throw in kids and it's a bit more effort. This is where soup comes in. I've found that if I puree vegetables in soup, my kids will eat them. Even if it's green. In the fall I put up kale (tear out the stems--feed them to the composting pigs or add them to the worm bin--blanch and freeze the leaves) and enjoy kale in hearty soups like this one. But I'm not in a hearty soup mood when there's so much green outside. Instead I wanted a summer soup. 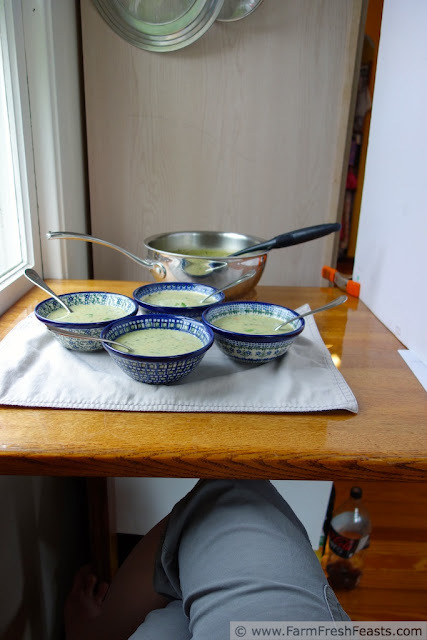 This recipe comes from a little blue cookbook I've had for a long time, Fantastically Finnish: Recipes and Traditions by Beatrice Ojakangas, though I see it was published the same year as my son, and he's only like 5 or something I think. I'm sure my mom picked it up, along with its Scandinavian brethren, at a Christmas bazaar. Mom gave it to me because I spent a summer working in Finland and learned to cook a few recipes there. Whenever I'd scan through the book this soup, Kesäkietto, always caught my eye. In the head notes, the recipe comes from Esther Louma of Duluth, MN. As written, it's a vegetarian recipe. Because I recently had not one but 2 chicken carcasses burning a hole in my freezer, I spent a day making a pot of chicken jelly and substituted a quart of chicken jelly for the water (see NOTE below). Since some varmint nibbled my pea plants (and parsley, and fennel, and tomato, and dill, though I have rescued almost all of them) I could not add the peas that this recipe calls for. Therefore, I've utterly changed the recipe but kept the spirit of it--spring vegetables gently cooked in a milk-based broth. I recommend you make this on a rainy late Spring/early Summer day, using whatever you've got available. 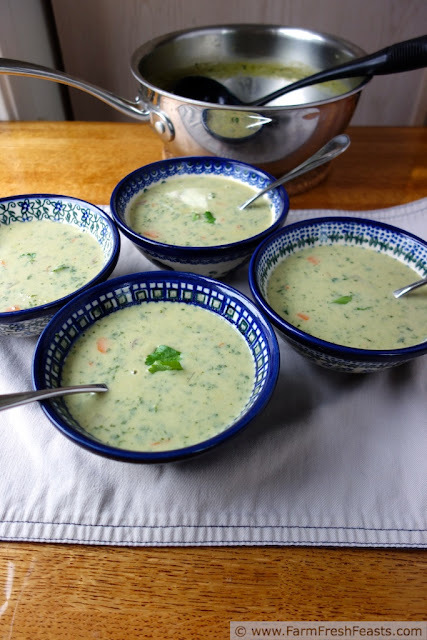 The nice thing about this recipe is that it makes 4 servings--so it's great if you have fewer eaters in the house, as you won't be eating this soup for a week. Place chicken jelly, salt, and the 2 cups chopped vegetables in a 3 to 4 quart sauce pan over medium high heat. Boil gently for 10-12 minutes. If you're not serving picky eaters, add the kale (and peas if you have them) at this point and continue cooking another 5 minutes until it is tender. If you are serving picky eaters, scoop out the cooked vegetables to a separate bowl, add the kale, cook 5 minutes, then use an immersion blender to puree before returning the cooked vegetables to the pot. Mix the flour with about 1/2 cup of the milk, until it no lumps remain. Add it to the soup, stir well, then add the rest of the milk. Simmer for 10 minutes, then turn off the heat and stir in the butter. Serve with parsley. Do you have a different assortment of vegetables to use? Try this Finnish Summer Soup from Kitchen Parade, which makes plenty for leftovers and is finished with dill! Note: What is chicken jelly? 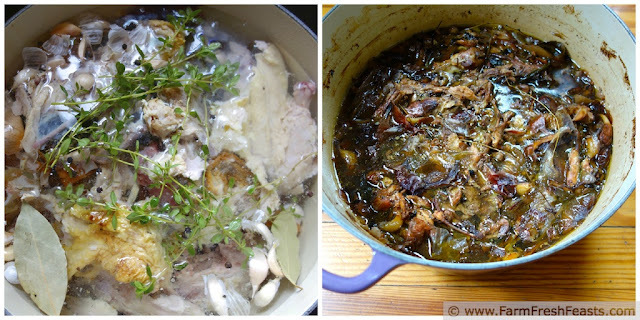 It happens when you keep simmering your chicken stock another couple of hours after "stock" is ready, so that it really reduces and concentrates and becomes jelly-like when chilled. It's my new way to make chicken stock, and the kids dubbed it chicken jelly. This post is shared with the Wednesday Fresh Foods Link Up, What's Cookin' Wednesday, What's In The Box--the traveling edition, the From The Farm Blog Hop, the Clever Chicks Blog Hop, Tasty Tuesdays, Hot Fun in the Summertime. I was giggling when I was typing it. Normally I don't leave my meandering mind up there for all to see, but this time I'm glad I did. Sometimes, around here especially the night before the next CSA farm share pick up, it really is 'finish all the kale' time. When I first read it, I thought "finish summer- wait summer hasn't even started" Oops! Speaking as someone who refuses to turn on the a.c. and enjoys a hot cup of tea all summer, I don't need to wait for a rainy day to enjoy this! (Although if I want my family eat soup too, maybe I should). I too enjoy a cup of hot tea each morning year 'round (though I've switched to iced in the afternoons now that it's warm) but I don't like to sweat just hanging out in the house, so I am grateful for both AC and, when the power is out, having a basement. We are actually very fond of kale around here - I use it in everything - scrambled eggs, salads, soups, casseroles - whatever. It really ramps up the nutrition and adds a nice flavor. It's a good thing too, since we grow a ton of it. I will definitely give this soup a try! Oh good, I can scan your site for more recipe ideas! My spouse will eat kale alongside me in whatever I fix, but when it's just me and the kids (in my head I had to double check I did that right because I heard my mom's voice say "the kids and I" for a second) finding ways they will enjoy it is a challenge. This looks great, I love the pictures! My hubby doesn't like kale, but I'm sure I could sub in another sturdy dark green easily. As for using up your kale, have you tried kale smoothies? I make them from time to time for my breakfasts, and they're actually pretty good. I use vanilla soymilk, natural or homemade peanut butter, rehydrated chia and flax seeds, and either bananas or avocados. 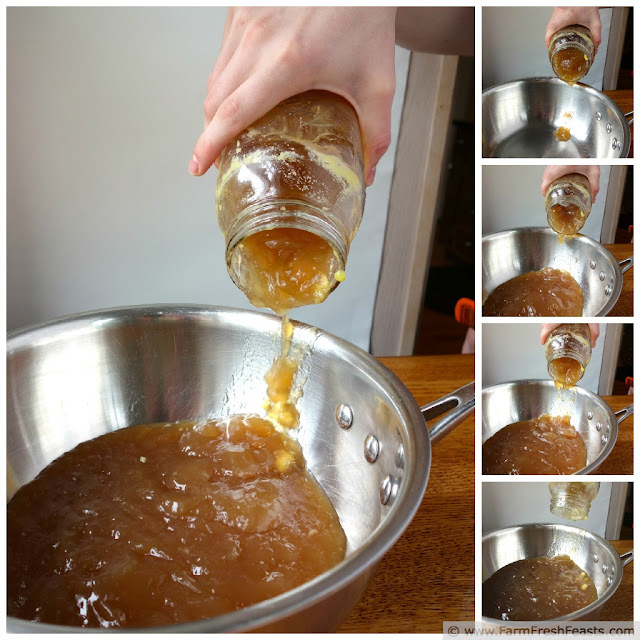 And honey for sweetening - that part is highly necessary. And I find that if I'm using avocado, then a little turbinado is also necessary (like, a teaspoon for the whole smoothie). If using bananas, then just the honey will do. I love green smoothies, though if I have a choice I prefer spinach in them. Somehow thus far I've missed out on the spinach in the large shares from the CSA farm share--I've gotten something else instead--but I've got some in the garden. Your smoothie sounds just delicious--a little honey does wonders for me! HEYYYY! I have that cookbook too! Maybe our moms bought them together?! And I had forgotten about that summer in Finland, thanks for the reminder! I love the addition of the kale - very pretty color! If you want to be "traditional" - the tiniest of the first vegetables are why this is called "summer" soup. But a long time ago, I made it with a bag of frozen mixed vegetables and it too was very very good! I look forward to having tiny vegetables to put in this . . . I am sure at some point the pea plant (it's got a flower now, finally) will cough up something. Unless it realizes that it's summertime. Meantime, the kale is piling up . . . I couldn't decide which photos to use and ended up emailing versions to my spouse since he has a better 'eye' than I do. I wonder if I jinxed something. The day I publish it starts getting warm and all the cool raininess seems to be gone! I love love love this Finnish soup and I bet I can finish it all too. That's the other thing of this recipe--there was just enough for us to eat, without days of leftovers. My kids are great about eating leftovers, but I hate to have too many pile up. I thought I commented on this post. Hmm, maybe just in my mind. Alright I'm not a huge fan of cooked kale, but the pictures in this post make me want to change my mind. It looks and sounds absolutely divine, and I love the little clusters of potatoes in the spoonful. Beautiful. I often think it would be wonderful to be able to push a button behind my ear and reply to an email with my mind. Then I think about my uncensored thoughts an I am glad such a device does not exist. I love to eat a hearty meaty stew when it's cold out--so I'll look for that during the fall kale season for sure. I commissioned my salt crock from a local artisanal potter . . . (my kids took ceramics for several summers in a row, and at some point I was running out of display space for their objets d'art and asked for a salt crock. It's got a lid, but when the lid is on you'll never know that it holds salt and ask me what weird ingredient that is in the photo.) I will pass on your compliments to my daughter. Love that the original recipe to this soup came from a woman in Duluth, MN! My family has a farm there - love seeing any connections to that place. :) Pinning this recipe to make soon. Thanks for sharing at Tasty Tuesdays! You're doing a terrific job co-hosting Tasty Tuesdays! I appreciate it. I am an everyday soup girl and I love this one. You're in wonderful company as an everyday soup girl. My daughter is an everyday soup girl too (but I was putting you in with Lydia and Karen--real Soup lovers). 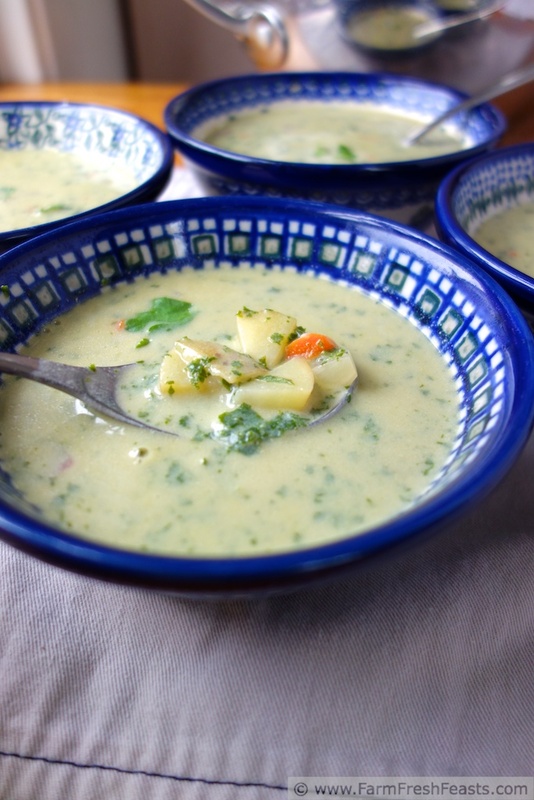 This soup just looks insanely delicious! Love the idea of kale in it, too! Thank you so much for linking up with me this week at Tasty Tuesdays! I’ve pinned this & shared it with my followers! Please be sure to stop back by the party and check out some of the other links! Thanks for hosting such an international link up.